Content: A smart fitness band; partner with the Goo Activ band for all your fitness activities whether you exercise occasionally, regularly, or whether you're a true competitor. 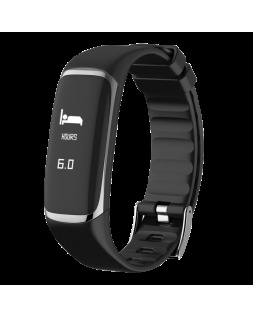 This activity band provides various fitness level indicators before, during and after your exercise session. The tracker band measures your blood pressure, heart rate, number of calories burned, number of steps taken, and distance travelled. Very light and equipped with an anti-loss system, this sports activity band is perfect for endurance sports such as Nordic walking, running, hiking, cycling, and triathlon. To allow you to measure your progress and adjust your training sessions to your goals, the activity band connects to your smartphone with the H Band app. Use this tool to analyse your performance, and monitor your condition daily, or activate the fitness function to track your speed in real time. Also, check out our health-focused smart devices for monitoring your fitness level and sleep quality.